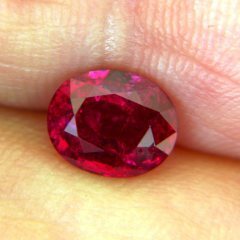 Comment: An exceedingly rare animal: Unheated and clean, 'bird-blood' Mogok ruby. Big face but no window. Inclusions and some surface dents (called 'naturals' and not counted as inclusions in the trade) are not visible to the eye but need a lens or our show-all 36fold magnified photos. Perfect classic shape, well cut with just the right relations between depth, length and width. Full ring size. Not many gems of this quality and pedigree are available at any given time. Richly saturated red with a barely visible tint of purple, no brown or pink, never-ever dark, never-ever pink in any light. IGI certified 'fine colour quality' which will translate to 'pigeon blood' at GRS or 'classic Burma' at AGL. Additional certificate free of charge for the buyer with some time to spare. $12.5k/ct won't last long. 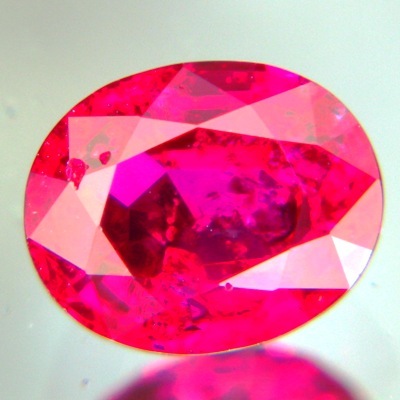 GRS vivid red, pigeon blood, Mogok ruby.